The Mongolians' nomadic way of life determined their diet, which traditionally consisted mainly of the meat, milk and other dairy products provided by the livestock which they tended. This included mutton, beef and goat, as well as milk and other dairy products from cattle and goats. Mongolians have traditionally not eaten bread, vegetables or fruit but most eat these things now. Some Mongols still refuse to eat vegetables “for health reasons”. But more have become so far removed from their traditional nomad diet, they eat the same foods as Chinese. Bread is often prepared in special ovens. Mongolians have traditionally been used to eating meat everyday. If they went a few days without meat they got grumpy and out of sorts. After stuffing themselves with mutton they were happy again. On occasion horse meat was eaten, but this was generally only at religious ceremonies and during festivals, as the horse enjoys a near-sacred status among the Mongols. As a a people of the steppe they traditionally roast meat over an open fire — or boil it if it is less tender A goat or a lamb might be roasted whole, or in sections, such as a leg of lamb. Mongolian Hot Pot is a traditional winter dish eaten throughout China northern China—by Mongolians and non-Mongolians alike—consisting of frozen bean curd, bean flour noodles, beef and mutton cooked with other ingredients and spices in a hot pot in boiling oil and broth. It is not much a Mongolian dish as it a Chinese adaption of one. In hot pot restaurants, customers often cook the ingredients in their own individual pots or a pot eaten collectively by a group that is heated by a burner under the table. When the ingredients are ready you pluck them out of the pot with your chopsticks and dip them in a tasty sauce and pop them into your mouth. Hot pot was created by nomads on the steppes of Mongolia. A Mongolian barbecue consists of meat, poultry and vegetables picked by the customer and then cooked on a big grill. It is more of an American invention. Some Mongolians regard it as a taboo to eat fish. This is a Tibetan custom. Eating fish is as abhorrent to Tibetans as eating pork is to Muslims and eating beef is to Hindus. Tibetan don't eat fish for several reasons. 1) fish sometimes eat the bodies of the dead ("water burial”---in which a body is dumped in a lake where fish can eat it---is one of the five ways of disposing of dead bodies). 2) water is considered sacred (fishing disturbs the water); and 3) fish don't have tongues, and hence they can't gossip. Tibetan detest gossip and they reward the fish for keeping their mouths shut by not eating them. Among herders the typical diet consist primarily of dairy products, mutton, milk teas, millet, koumiss and liquor. The traditional staples of a Mongolian herders diet have been milk, milk products and meat from the animals they herded. Milk products were consumed fresh in the summer and fall. Butter was made from milk, skimmed of during boiling. The remaining milk was fermented with a special yeast to make various kinds of cheeses and yoghurt. Some milk was fermented and distilled into a special kinds of vodka. After distillation the remaining curdled liquid was mixed with flour, roots and bird cherries and frozen into a solid that was consumed during the winters. Mongolians generally don’t eat horse meat. Kazakhs eat horse sausage. Horse jerky is marketed as a pet food. A typical nomad "hospitality bowl," which is offered to guest contains chunks of tart homemade cheese, sugar cubes, sweet crackers, hard candies, pastries deep fried in yak or mutton fat, vodka and koumiss when it is in season. Guests are often offered a stew made with animal testicles. On Ewan MacGregor’s motorcycle trip through Mongolia in 2004 he and his riding buddies were offered stew with over 200 testicles from horses, cattle and mostly sheep. They were able to eat the first one but had difficulty downing the others. Mongolians have traditionally not eaten with chopsticks. They have generally used a spoon, fork or knife or just their hands. Boiled meat is passed around in a large communal bowl with a knife. People slice of meat. The choicest pieces are the ones with the most fat. These days in Inner Mongolia and elsewhere in China, many Mongolians eat with chopsticks and observe the same eating customs as Chinese. After entering a yurt guests are offered tea with milk and salt in a bowl, and a plate with various cheeses and/or bread or cookies. Guests accept what is offered to them with their right hand, with the left hand offering support at the elbow; pick up things with an open hand and a palm facing upwards; and hold their tea bowl at the bottom rather than the top. Visitors are expect to take at least one small piece or a sip of what is offered to them. To do otherwise is considered very rude. At the same time don’t gobble down everything in sight. An empty bowl or an empty plate is an invitation for more. If you don’t want more simple leave a little in your bowl or plate. Kazakhs indicate they don’t want more by placing a hand over their bowl or plate. The taste of koumiss has been described as "across between buttermilk and champagne" with a “tang reminiscent of good pickle brine” or a strong smoked gouda and is said to be high in vitamin C. Hillary Clinton tried some when she visited Central Asia . She said it tasted like yoghurt. Other have said it tastes like “stomach bile.” Its white color is equated with purity. Koumiss has been around for thousands of years and is a fixture of daily life as well as festivals, feasts and big celebrations. During Tsagaan Sar, the Mongolian New Year, koumiss is presented to all guests and is part of the welcoming ritual for the White Month. In the old days servants who were late reportedly had to down five to 10 liters of koumiss as a punishment. Mongolians insist that its healthy because it made of milk. William Rubrick wrote in the 13th century: “At the taste of it, I broke out in a sweat with horror and surprise...It makes the inner man most joyful, intoxicates weak head and greatly provokes urine.” The Mongolian provinces of Arkhangai, Bulgan , Overkhangai are said to produce the best airag. Mare’s milk is much thicker than cow’s milk and is so sweet that it seems like it has sugar added. It is the sugar content that allows it be fermented and made into an alcoholic drink. Koumiss is generally only available in the spring and summer, when mares are foaling. The milk is drawn from a mare by allowing a foal to start nursing and then pulling the young animal away but keeping the foal beside the mother. Milking a mare is a difficult and even dangerous procedure. A herd of 600 horses produces about 25 gallons of milk a day. The milk is the collected in a bucket and poured into rawhide bags. Some starter is added from the last batch to churn along with 2½ gallons of mare’s milk, half gallon of water and some cow butter to keep the leather flexible. The churn is a barrel-size bag with a stick sticking out the top. The mare’s milk mixture is churned 500 times a day, or churned fewer times every few hours, during the three or four days it takes to ferment. On the last evening it is churned 5,000 times until it curdles. Bags of fermenting koumiss hang in leather bags inside gers to left of the door, It is customary for visitors to a ger to stir the koumiss to assist fermentation. Mongolian clothing has traditionally been made to be strong, warm, durable and comfortable and flexible when riding on a horse or sitting on the floor of a yurt. Both men and women wear dels (caftan-like, ankle-length padded silk robes lined with sheepskin for the winter and tied around the waist with a sashlike belt) in the winter and a terlig (thinly-lined coat similar to a del) in the summer. In the cities most people wear Western clothes and don traditional clothes for festivals and special events. On the steppe you can find people who wear traditional clothes for everyday use. Many people have several dels. Elaborate ones made from nice fabrics for dress up occasions and everyday ones that are okay to get dirty. Different clans, tribes and ethnic groups often have distinguishing markers or fashion styles on their dels that all Mongolians recognize. Mongolians have traditionally worn wool in the winter and cotton in the summer. Wool is also used to make saddle bags, bridles and ropes. Leather and fur are used to make various parts of clothing. Mongolians are fond of bright colors. The dels are often bright colored and have a silky sheen and are trimmed with a bright color of contrasting shades and colorful edging. Theroux wrote: "Mongolians wore mittens and boots; in this brown country they favored bright colors—it was not unusual to see an old man with a red hat and a purple frock coat, and blue trousers stuck into his multi-colored boots." Dels (Mongolia robes) are designed for horseback riding, keeping riders warm while not constraining them. They have high collars that can be buttoned or unbuttoned. The left side buttons close over the right side. Sometimes a long sash or leather belt adorned with silver or copper ornaments is tied around the waist. Under theirs dels, Mongolians generally wear baggy trousers and a shirt. In the winter Mongolians wear sheepskin coats and cloaks with wool facing inward. Shepherds in some parts of Central Asia, have traditionally worn a loose hooded felt cape, called a kepenek that keeps them dry in the heaviest of downpours. "Without a kepenek I couldn't last half a day in the rain," a shepherd once said. "With one, I can stay out until I need to go home." Kepeneks are used throughout Central Asia as a tent and blanket as well coat and they are said to be so stiff and sturdy they stand on their own. Men and women wear Mongol gutal (embroidered leather knee boots with thick soles and upturned toes). There are several explanations as to why the boots are made in this way. Some say they give riders confidence that they won’t slip from the stirrups. Other says that Buddhism is the reason: the upturned toes are said to be less likely to kill insects than conventional footwear. In the winter felt is placed in them for extra warmth. Traditional flat felt boots are made for horseback riding. They are sometimes uncomfortable for walking. Headgear is often an indicator of where someone is from. Mongolia men sometimes don loovus (pointed hats) on feast days or weddings or other important occasions. These have traditionally been made of wolf or fox skin and are said offer good protection in the cold and wind. Other types of men’s hat include the janjin malgai and toortsog. Women often wrap their heads in a kerchief. It is said that the custom dates of women wearing scarves dates back to Genghis Khan times. When Genghis Khan unified the Mongol tribes, he ordered that everyone should wear a scarf to symbolize there was a part of the Mongol flag on their head and express pride to be Mongols. On their wedding day, Mongolian women wear graceful and luxuriant ornaments that go with their splendid attire. 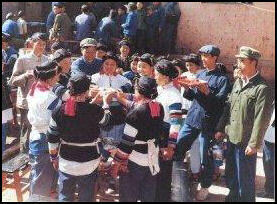 The headwear in Ordos is most typical of this kind of Mongolian headwear. Translated as "fillets", this kind of headware is mainly composed of "pendants" and "hair covers" and is typically worn in pairs: one on each side of the head. It is not only made with masterly craftsmanship, but is also decorated with hundreds of corals, dozens of silver chains, pearl clusters, and many silver loops, silver sheet, and carnelian. When it is worn, the fillet looks like a pearl-decorated curtain hanging before the face. A pair of fillet weighs three to four jins (one jin equals half a kilogram), and some can weigh as much as ten jins. It is said that only flocks of fine horses or hundreds of fine camels were not enough to barter for a top-grade pair of fillet. Buriat men and women have traditionally worn headgear made from sewn fabric or fur from beavers, otters, fox or other animals. In Inner Mongolia, people wear a variety of headgear including turbans, round felt hats decorated with colored beads or astrakan or felt hats with brims. Cowboy hands are also popular as they are in Tibet. Men used to wear their hair pulled back in a braid. Women wore theirs in two braids covered with velvet. The braids were worn in front of the shoulders and silver and coral ornaments were woven into them. Young girls wore multi braids joined at the temple with red thread. Today, some girls wear their hair parted in the middle, embellished with two large beads and agate, coral and green jade ornaments. In the old days upper class women wore elaborate headdresses and sculpted the hair in bizarre horn-like designs with hardened mutton fat and tied their hair with jewelry pieces made of silver, turquoise and coral. The French artists working on the second set of Star Wars films modeled some of the costumes worn by Queen Amidala (the Natalie Portman character) after some of the more showy examples of a Mongolian female dress. During festivals, even some nomads wore their hair in massive headdresses, decorated with silver and coral, or tied their hair with large bows. A family’s wealth was often measured by precious stones and metals in a woman’s hair. Men on the steppe often wear a bus (an embroidered waistbelt), and sometimes carry daggers or swords with silver ornaments. On the right side of the belt men have traditionally carried a tobacco pouch with tobacco, a snuffbox, a knife in a sheath and steel for starting fires. Pipes were carried in the boots. The steel, tinder and flint for starting fires were carried in a special sack, often beautifully embroidered and even adorned with silver plates. In the old days steel was so highly valued for starting fires it could be exchanged for a horse.